Check out the final of Season Two of "SwingNation," the world's only live streamed talk show on swing dance and lindy hop. I can't believe my production team of Manu, Nicole, Frank, Jim and I have slammed out nearly 30 of these shows!?! We get a little giddy in this last show of the season, featuring some really cool videos and silliness. We hope you like it. BTW, I got a Roku player from my dad for my birthday. 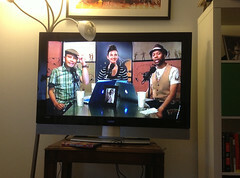 I realized that I can watch podcasts on my TV now, including "SwingNation." Hey, look ma, I'm on TV! We'll be back in September, after — hopefully — a successful livestream from the International Lindy Hop Championships in DC in August! Thanks for watching.